Bus from Seremban to Alor Setar is an important transport service to allow resident from Seremban to northern region of Malaysia. Bus service remain the preferred option to travel from Seremban to Alor Setar because of bus frequent schedule and relatively budget bus fare. 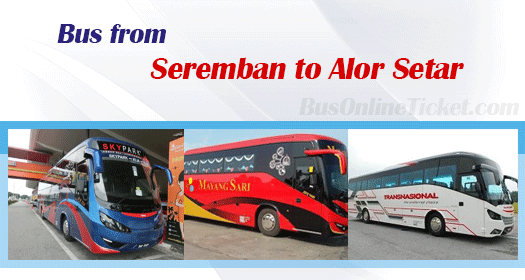 Trans MVS Express, Mayang Sari Express, KPB Express, Intercity Coach and Transnasional are few bus service providers supplying bus service from Seremban to Alor Setar. KPB Express is the main player among them by having up to 4 daily trips. Intercity Coach is the only operator run the service route with high deck luxury coach, while others are operating the route with single deck VIP coach. The first bus service starts at 8:00am, provided by Trans MVS Express. The last bus leaves the bus terminal at 11:00pm. In between, there are number of departures from Seremban to Alor Setar. Please note that there is no bus service available during afternoon session. The duration required for bus from Seremban to Alor Setar is approximately 7 hours plus depending on the road traffic condition. At least one washroom break will be given during the journey. Passengers can request extra toilet break from the driver along the highway. The bus fare from Seremban to Alor Setar is costing within a range from RM 49.00 to RM 53.40 where price is differ from operator to operator. The boarding point in Seremban is located conveniently at Seremban Bus Terminal 1 while the arrival point in Alor Setar is located at Alor Setar Bus Terminal (it is known as Shahab Perdana Bus Terminal). Hurry up and book your bus ticket from Seremban to Alor Setar at BusOnlineTicket.com. BusOnlineTicket.com is the reliable and user-friendly online booking portal that allows you to purchase bus ticket online in your fingertip. Instant booking confirmation will email to you upon the payment is received.